Another project on my to-do list, that is! “Project 4: Hang two long shelves” can now be checked off my way-too-long to-do list. There really isn’t much to say. I bought the shelves at ikea and followed the directions inclosed to hang them. But, in the spirit of blogging – taking totally mundane chores and somehow make them interesting by writing about them, I’ll go ahead and blather on about the shelves for a minute or two. Or ten. 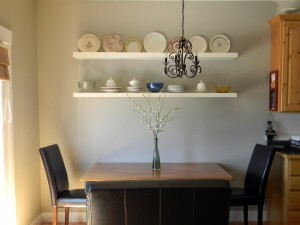 I first decided to hang these awesome floating shelves in the dining room after seeing them over at I Heart Organizing. I mean, seriously. 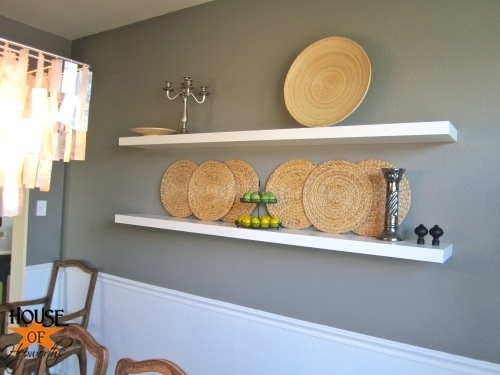 Who wouldn’t be inspired to hang floating shelves after seeing Jen’s? 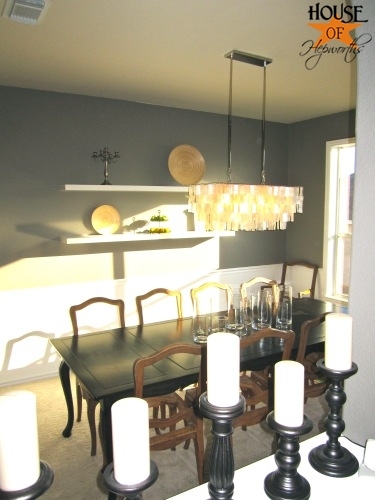 Then Leanne from Organize and Decorate Everything went and hung some in her breakfast room. Sold. After seeing these three pictures, I was officially twitterpated. 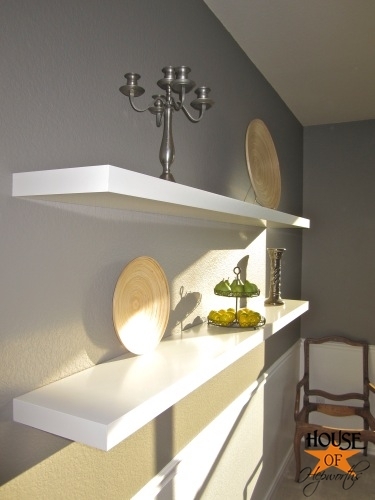 Floating shelves were my destiny. (Yes, I’m aware that I’m being ridiculously over-dramatic about this.) 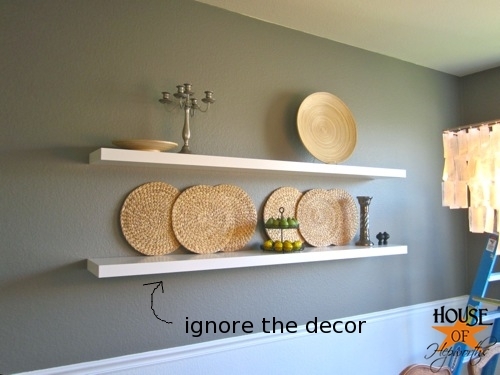 I first mentioned my love for the floating shelves in this post. Fate sealed itself when on two separate occasions I found the exact shelves I needed (in the right color and length) in the as-is section of ikea (yes, I do live there thankyouverymuch). Ironically the $10 shelf had less damage than the $20 shelf, but neither had any that would be visible once the shelves were hung, so I bought them. 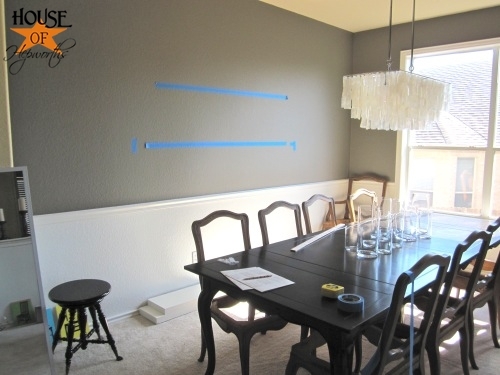 The only space planning I did was to very haphazardly hang two pieces of painters tape on the wall, just to give myself an idea of where I wanted the shelves. The tape wasn’t even the right length and it was certainly not level, but it gave me a good visual anyway. After I decided on the height placement, I wanted the shelves centered on the wall. I knew I was going to hang curtains so I measured the length of the wall minus 3″. This way the shelves will be centered between the left wall and the curtain so that they will appear centered once the curtains are hung. Hanging them wasn’t that tricky, but they each needed SIXTEEN anchors and screws, all of which did NOT come with the shelving. 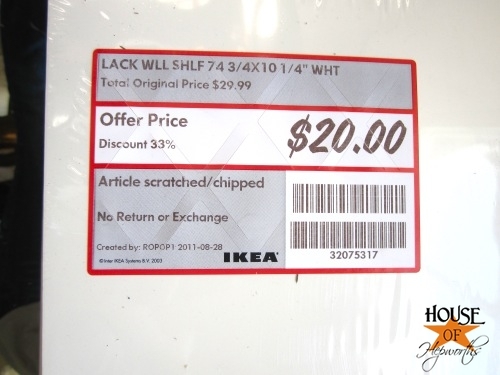 This ended up being an additional cost of $10 total just for hardware, so keep that in mind when you plan on hanging shelving from ikea. Most doesn’t come with the screws. One thing I’ve learned is that this room photographs much better in the morning than at 5pm. Sorry all of my pictures have a horrible glare on them. Also, I may be good at hanging shelves and tiling and refinishing furniture, but I’ll tell you what, adding little bits of decor into a room is not my strong-suite. These shelves are ZERO percent staged and ready. I just threw some crap on them and took the pictures. 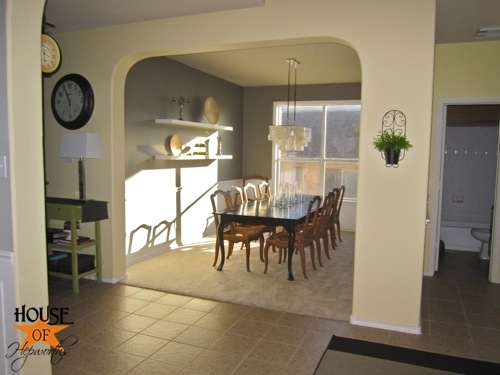 Look closely and you’ll notice most pictures have a different combination of decor on them. I pretty much “staged” them by piling a bunch of crap on them that’s been sitting on the floor in the dining room for months. I do have a few things in mind for decorating the tops of the shelves, and I promise, when this room is finally done and I do a final reveal, the decor will look good. Pinky promise. It is very satisfying though knowing that I’m one step closer to finishing this room that I started eight months ago. I can officially check off 7 things from my to-do list. Only 17 more to go. And I’ll tell you a little secret… I’ve finished 2 more things, I just haven’t blogged about them yet. Woo hoo! I’ll show you soon, promise. Looking good girl! You are on a ball! Love the shelves! 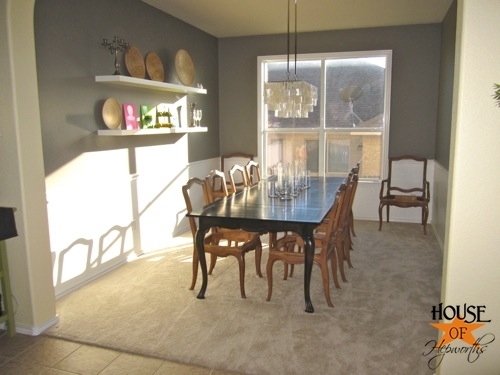 Really love that paint color in your dining room, too! What is it?!! Looks great! I need you to get my motivation in gear so I can cross things off my to do list! 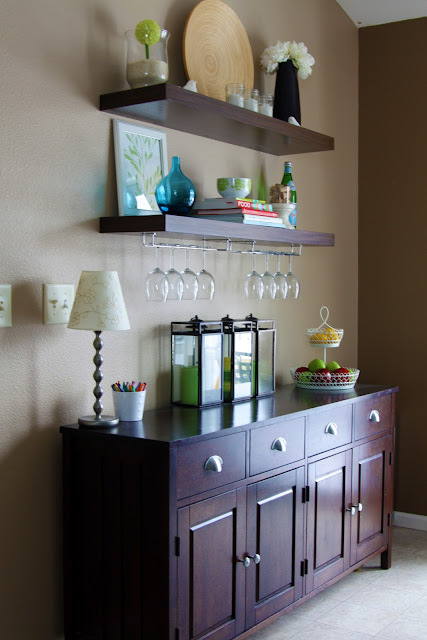 Oh how I love those shelves in your dining room! They are going to be so much to decorate! 🙂 And can I tell you how flattered I am that I was your inspiration? What a great deal you got! Have fun with them! 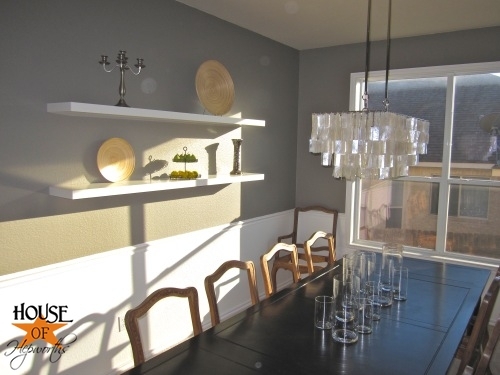 The shelves look awesome in your dining room. I love your wall color too. You got such a great deal on them. Thanks for including my shelves in your awesome group. I think we should start an Ikea Shelf Club. 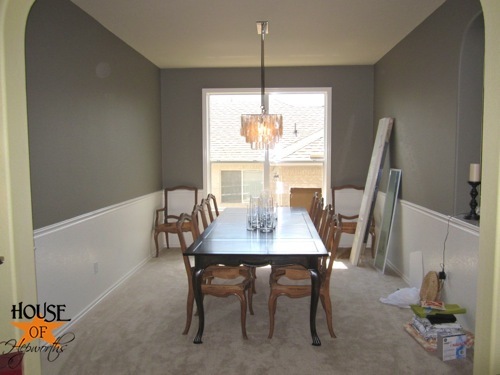 Great progress on your dining room. I’m having fun following along! And nice work finding these in the sale section of IKEA. 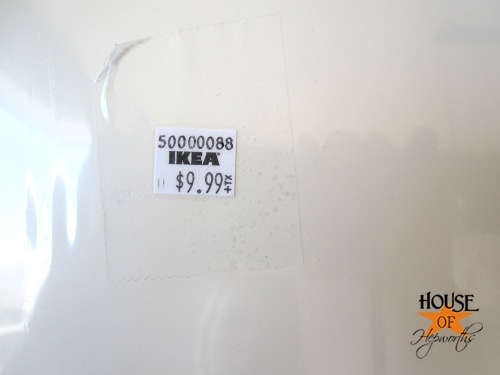 My nearest IKEA is a 3 hour drive…I didn’t even know they had a sale section! Anyway, the shelves look great. I hung some over my washer and dryer and love them, too! It looks great!! I love those shelves. Ok, I LOVE those shelves. I may have to reconsider my kitchen plans to include some now! I wouldn’t have thought of measuring out 3 inches for the curtains, so thanks for that tip. I want to put up shelves in my bedroom. I already have a few small ones but I want at least 3 in a row by my desk. Then I’m going to showcase some of my Barbie Collection and doodads. Maybe a shelf by the desk for organizing stuff/supplies nearby. Thanks for sharing! Awesome job on the shelves! 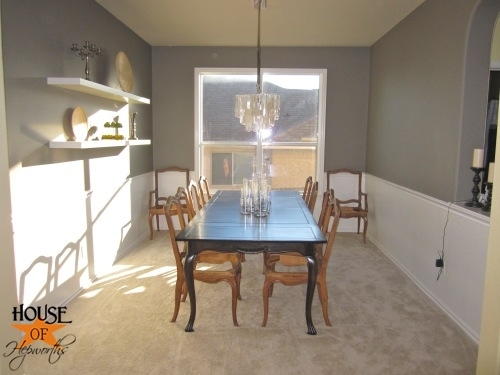 Can you tell me what color you painted your dining room walls. Love it!